Relying on written notes to set a reminder means leaving your productivity up to chance. You miss deadlines, forget tasks, and let the easiest parts of your day fall from your radar. Wouldn’t you rather send reminders straight to your inbox when you know you’ll see them? We know why sticky notes are ruining your life and how to fix it. Check out the risks you’re taking with written reminders and how to turn over a new leaf by sending tasks straight to your inbox instead. Pro tip: Get reminders in your inbox with this insanely simple plugin. Stress and forgetting go hand-in-hand. When you’re stressed throughout the day, the effects can interfere with your memory. Our bodies react to stress by pushing stress hormones into the bloodstream. In the long run, stress can even damage areas of the brain. Fact: 70% of unanswered sales email chains stop after the first attempt. Which means the 30% of sales emails that do follow-up stand a better chance. Intentional or not, you’re missing out on opportunities and handing them to competitors. When you forget a task, you don’t only hurt yourself. And your errors affect how your team treats you. Picture this: Being left out of the loop, micro-managed, and viewed as a last resort for collaboration. You shouldn’t have to babysit your coworkers, but sometimes getting sh*t done requires it. The issue here is that when you rely on yourself remembering to send a reminder, it puts another task up to chance. You see the domino effect here, right? A desk full of sticky notes with reminders all over. It’s like they’re sitting there, waiting for accidental disposal or coffee spill. That, and they don’t travel with you. Work from home for a day and you completely lose phone numbers, names, and other information you need. It’s our mission to help you work smarter from your inbox. That means acing every step of an email from subject line to send time. Sending an email at the right time is crucial. You need to find a time that works for your recipient rather than staying focused on yourself. That’s why we created our Best Time to Send Email Map. It’s a quick, interactive way to see when the ideal time to send an email is. Once you have the best time to send an email, use Send Later to make it a reality. This comes in handy especially when the right time to send falls during less than ideal hours for you. How it works: Select the time, date, and time zone you want your email delivered. Then sit back and relax, knowing your Send Later will arrive at the best time possible. If you don’t want to rely on your own memory to send a follow-up email, try out Reminders. 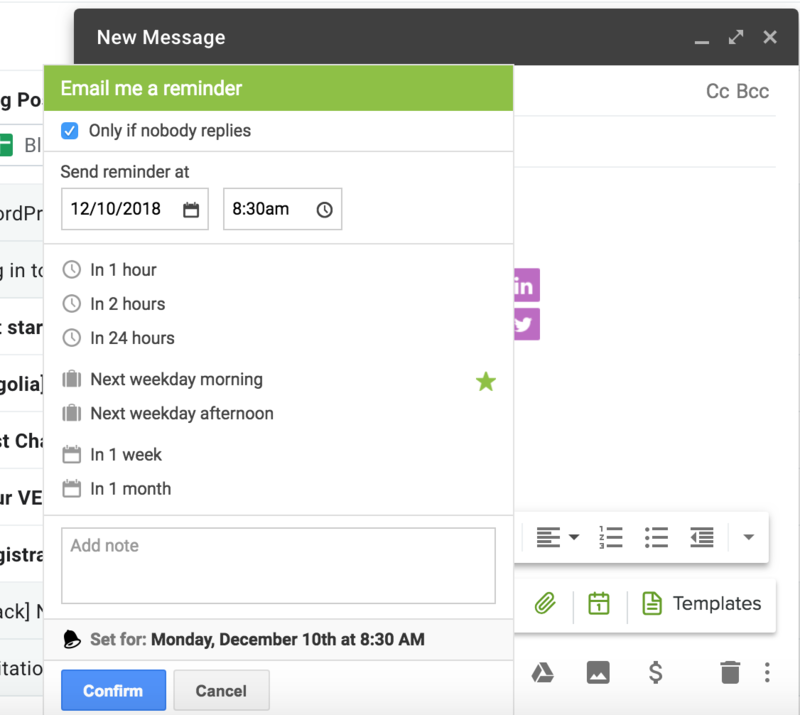 The Reminder will show up at the top of your inbox, threaded with the email you need to follow-up on. You can set up Campaigns right in your inbox. This way, you put follow-ups on auto-pilot based on whether your recipients replied to the previous email. How it works: You write emails and create custom tasks at your convenience. A quick click schedules them to send at your recipient’s convenience. This takes away the burden of remembering to follow-up.